In 2017, U.S. health care costs were $3.5 trillion. That makes health care one of the country's largest industries. It equals 17.9 percent of gross domestic product. In comparison, health care cost $27.2 billion in 1960, just 5 percent of GDP. That translates to an annual health care cost of $10,739 per person in 2017 versus just $146 per person in 1960. Health care costs have risen faster than the average annual income. Health care consumed 4 percent of income in 1960 compared to 6 percent in 2013. There were two causes of this massive increase: government policy and lifestyle changes. First, the United States relies on company-sponsored private health insurance. The government created programs like Medicare and Medicaid to help those without insurance. These programs spurred demand for health care services. That gave providers the ability to raise prices. A Princeton University study found that Americans use the same amount of health care as residents of other nations. They just pay more for them. For example, U.S. hospital prices are 60 percent higher than those in Europe. Government efforts to reform health care and cut costs raised them instead. Second, chronic illnesses, such as diabetes and heart disease, have increased. They are responsible for 85 percent of health care costs. Almost half of all Americans have at least one of them. They are expensive and difficult to treat. As a result, the sickest 5 percent of the population consume 50 percent of total health care costs. The healthiest 50 percent only consume 3 percent of the nation's health care costs. Most of these patients are Medicare patients. The U.S. medical profession does a heroic job of saving lives. But it comes at a cost. Medicare spending for patients in the last year of life is six times greater than the average. Care for these patients costs one-fourth of the Medicare budget. In their last six months of life, these patients go to the doctor's office 29 times on average. In their last month of life, half go to the emergency room. One-third wind up in the intensive care unit. One fifth undergo surgery. Between 1960 and 1965, health care spending increased by an average of 8.9 percent a year. That's because health insurance expanded. As it covered more people, the demand for health care services rose. By 1965, households paid out-of-pocket for 44 percent of all medical expenses. Health insurance paid for 24 percent. From 1966 to 1973, health care spending rose by an average of 11.9 percent a year. Medicare and Medicaid covered more people and allowed them to use more health care services. Medicaid allowed seniors citizens to move into expensive nursing home facilities. As demand increased, so did prices. Health care providers put more money into research. It created more innovative, but expensive, technologies. Medicare helped create an overreliance on hospital care. Emergency room treatment is very expensive, making up one-third of all health care costs in America. 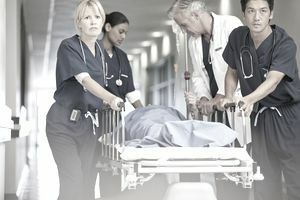 By 2011, there were 136 million emergency room visits. An astonishing one out of five adults use the emergency room each year. In 1971, President Nixon implemented wage-price controls to stop mild inflation. Controls on health care prices created higher demand. In 1973, Nixon authorized health maintenance organizations to cut costs. These prepaid plans restricted users to a particular medical group. The HMO ACT of 1973 provided millions of dollars in start up funding for HMOs. It also required employers to offer them when available. In 1973, Nixon completely abandoned the gold standard. As the dollar's value plummeted, it unleashed double-digit inflation. Health care costs rose at the same rate. From 1974 to 1982, health care prices rose by an average of 14.1 percent a year for three reasons. First, prices rebounded after the wage-price controls expired in 1974. Second, Congress enacted the Employee Retirement Income Security Act of 1974. It exempted corporations from state regulations and taxes if they self-insured. Companies took advantage of these lower-cost and flexible plans. Third, home health care took off, growing by 32.5 percent a year. After 1998, people rebelled and demanded more choice in providers. As demand increased again, so did prices. Between 1997 and 2007, drug prices tripled, according to a study in Health Affairs. One reason is that pharmaceutical companies invented new types of prescription drugs. They advertised straight to consumers and created additional demand. The number of drugs with sales that topped $1 billion increased to 52 in 2006 from six in 1997. The U.S. government approved expensive drugs even if they were not much better than existing remedies. Other developed countries were more cost-conscious. The nation’s reliance on the health insurance model increased administration costs. A 2003 study found that administration made up 30 percent of U.S. health care costs. It's twice the administrative costs in Canada. About half of that is due to the complexity of billing. For example, U.S. private doctors' offices need seven people to do billing for every 10 physicians. A big reason is that there are so many types of payers. In addition to Medicare and Medicaid, there are thousands of different private insurers. Each has its own requirements, forms, and procedures. Hospitals and doctors must also chase down people who don't pay their portion of the bill. That doesn't happen in countries with universal health care. The reliance on corporate private insurance created health care inequality. Those without insurance often couldn't afford visits to a primary care physician. By 2009, half of the people (46.3 percent) who used a hospital said they went because they had no other place to go for health care. The Emergency Medical Treatment and Active Labor Act required hospitals to treat anyone who showed up in the emergency room. These uninsured patients cost hospitals a staggering $10 billion a year. The hospitals passed this cost along to Medicaid. The second cause of rising health care costs is an epidemic of preventable diseases. The four leading causes of death are heart disease, cancer, chronic obstructive pulmonary disorder, and stroke. Chronic health conditions cause most of them. They can either be prevented or would cost less to treat if caught in time. Risk factors for heart disease and strokes are poor nutrition and obesity. Smoking is a risk factor for lung cancer (the most common type) and COPD. Obesity is also a risk factor for the other common forms of cancer. Recent research found that even Alzheimer's disease might be preventable. The study, called SPRINT MIND, found that high blood pressure could worsen dementia caused by Alzheimer's. By 2009, rising health care costs were consuming the federal budget. Medicare and Medicaid cost $676 billion. That was 19 percent of the total budget of $3.5 trillion. Payroll taxes only cover half of Medicare and none of Medicaid. This so-called mandatory spending also included federal and veterans' pensions, welfare, and interest on the debt. It consumed 60 percent of the federal budget. Congress knew something had to be done to rein in these costs. By 2020, retiring baby boomers will drive Medicare and Medicaid costs to 24 percent of the budget. As health care costs increase faster than economic growth, Medicare taxes and the Trust Fund will cover less and less. By 2030, the Trust Fund would be bankrupt, and taxes would only pay for 48 percent of the costs. Federal health care costs are part of the mandatory budget. That means they must be paid. As a result, they are eating up funding that could have gone to discretionary budget items, such as defense, education, or rebuilding infrastructure. Obamacare's goal is to reduce these costs. First, it required insurance companies to provide preventive care for free. That treats chronic conditions before they required expensive hospital emergency room treatments. It also reduced payments to Medicare Advantage insurers. Since 2010, when the Affordable Care Act was signed, health care costs rose by 4.3 percent a year. It achieved its goal of lowering the growth rate of health care spending. The ACA reduced payments to Medicare Advantage providers. The providers' costs for administering Parts A and B were rising much faster than the government’s costs. The providers' couldn't justify the higher prices. Instead, it appeared as though they were overcharging the government. Medicare began rolling out accountable care organizations, bundled payments , and value-based payments. Spending on hospital care has stayed the same since 2011. Part of the reason for this is that hospital readmissions dropped by 150,000 a year in 2012 and 2013. That’s one of the areas hospitals get penalized if they exceed standards. It resulted in increased efficiency and quality of patient care. High-income earners paid more in Medicare payroll taxes and Part B and D premiums. For more, see Obamacare taxes. In 2013, sequestration lowered Medicare payments by 2 percent to providers and plans. Based on these new trends, Medicare spending was projected to grow just 5.3 percent a year between 2014 and 2024. 2008 $2,399.1 4.5% $7,897 Recession slowed spending. 2017 $3,492.1 3.9% $10,739 Drug costs rose just 0.4%.